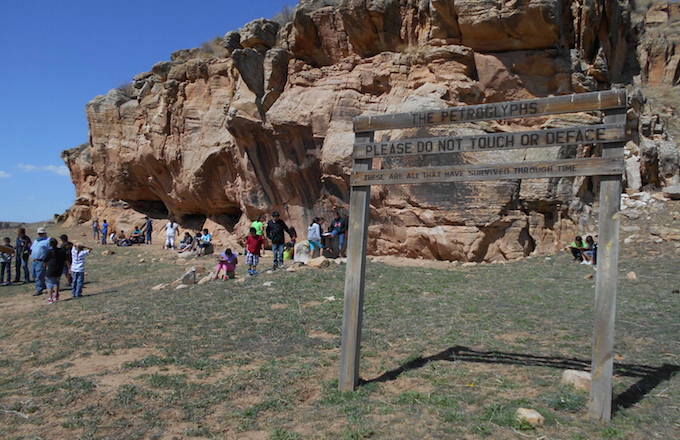 Students traveled to historic petroglyphs in the sacred Black Hills during a recent field trip with staff from the school's Lakota Language Program and The Heritage Center's Education Department. Audrey Jacobs, the museum educator at The Heritage Center spoke with students about the rock art that was created by some of the student's ancestors more than 10,000 years ago. The field trip is part of an ongoing effort to connect Lakota culture and language, art, and education initiatives at the school. Jim Kent from South Dakota Public Broadcasting followed along and had the following story to report. In this high-tech world of instant communication it may be hard to imagine leaving a message for someone that might take hours or even days to compose…and that the recipient might not receive for hundreds of years. But we learned, along with a group of Lakota students, that’s exactly what ancient Indigenous people did in what’s come to be known as “rock art”. It’s a rough ride along a narrow, winding road to reach the secluded area where ancient Indigenous people once camped and left their messages on the face of a towering sandstone outcrop. Located on land that’s part of the Black Hills Wild Horse Sanctuary, this historic site dates back at least 10,000 years to the last Ice Age. Images of ancient elk and mammoth are just two of the petroglyphs that adorn the extensive rock wall. Visiting the Petroglyph Site today are Lakota students from the Pine Ridge Reservation. Audrey Jacobs is the Museum Educator for the Red Cloud Indian School’s Heritage Center. She’s here to help explain the ancient art. Jacobs says having the opportunity to bring the students to this site is not only educational but could also be inspirational. The trip to the Sanctuary also gives the students an opportunity to see another important part of their Lakota history…the wild horse. Audrey Jacobs says it’s one thing to know that wild horses were a huge part of your culture. But to see them along with ancient rock art can actually bring the past to life.